When the pilot light stops working you do not have hot water. Then you notice. A malfunctioning pilot light may be a sign of another problem. It could be that it just needs to be lit again. There are (4) Key Topics related to this subject. (1) Why it is important to 'Following the Instructions', (2) 'Using an Ingnitor' to light your pilot light, (3) 'Manually Lighting a Pilot Light' and (4) Other pilot light issues like the 'Thermocouple' or the 'Gas Valve' may need some additional attention. Use one of these links to find what you need or read the overview below. Don't they have electronic ignition systems that will just light the gas when needed? Yes, they do. Most gas furnaces have such a system. Why don't water heaters? They do, but it is a matter of cost. A high efficiency hot water heater with electronic ignition will run you a $1,000 or more. Whereas, a standard gas model might be as little as $350. The added cost results in the majority of units still using a water heater pilot light. This article will help you with the issues that a pilot light can cause. A serviceman that comes out will likely tell you your problem is a defective thermocouple. The bill for replacing it will be between $125 and $150. Up selling you to a new water heater is also a possibility. Plan on $800 to $1,500 if that happens. Lighting a water heater pilot light is not that hard. It should take less than ten minutes. You're at the simplest problem you can have with a gas hot water heater. Sorry, there is nothing easier. A pilot light that won't stay lit may be indicative of a more serious problem. You will be without hot water if you cannot fix it. You can get a lot of complaining when this happens. There are two types of pilot lights that you may need to deal with. The older style that requires a match to light it. Then there are the newer ones that have an ignitor. Some high efficiency hot water heaters use and electronic ignition and do not have a pilot light. Gas water heaters are equipped with a thermocouple, this is a safety feature that keeps the gas valve from allowing gas to flow when it is not being burned. See the questions below to try and narrow down your problem. When the pilot light goes out completely there are a few possible explanations. As with many problems, you want to eliminated the simple and obvious things first. So we will address this problem from that standpoint. Was the gas supply interrupted for any reason. There could be many possibilities. We list some of the possible reasons below, but there could be other reasons. The simple thing to check first would be whether or not you have gas to other devices, such as a stove or oven. Even if the stove or oven lights now, it does not mean that the gas was not shut off for a brief period of time. Other gas devices have ingniters that will ignite the flame after the gas supply is restored. Your water heater probably does not have this feature. See the list below and see if any of the possible situations may have happened. If the gas supply was intterrupted even for a short period of time, you will need to 're-light the pilot light'. See the article on 'lighting a pilot light' for instructions on what to do. Pilot Light Blown Out - Is there a chance that a strong gust of air might have blown the pilot light out? This is more likely when the water heater is in a closet that is used for other things that may require the door being opened repeatedly. This is a strong possiblilty if the outer or inner cover plate has been removed for any reason. The pilot light is a small flame no bigger than a butane lighter flame. If a gust of air gets to it, it will blow out. Working On Gas Devices - Did you work on any other gas devices in your home? Maybe you were working on the stove or a gas dryer. Of course the safe thing to do is shut the gas off before you work on the appliance. Unfortunately, even if the gas is only shut off for a few minutes, it will cause the pilot light on a gas water heater to stop working. If the thermocouple does not sense continuos heat from the pilot light, it sends a signal to the gas valve and no more gas will be sent to the pilot light. This is a safety feature to prevent natural gas explosions. If this has happened, you need to go through the process of lighting the pilot light. Before you proceed with the lighting procedure, make sure you have turned the gas back on. 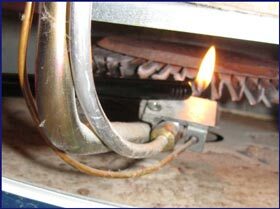 See the article on 'lighting a pilot light' for instructions on what to do. When this happens lighting the pilot again is the only solution. See the article on 'lighting a pilot light' for instructions on what to do. Utility Work at the Street - Has any utility work been done at the street, in front of or near your home? Many times it is a safety precaution to turn the main gas line off when utility work is done. If you are unsure, a call to your gas utility provider will tell you if there have been any intterruptions in the supply. Again, even if the gas was shut off for a brief period of time, the pilot light will need to be lit again. Verify that the gas is back on and see the article on 'lighting a pilot light' for instructions on what to do. Shut Off by the Utility Company - Okay, we're all imperfect and things happen. Did the bill not get paid, for whatever reason? Maybe it was an oversight. Maybe you were trying to stretch things a bit. Maybe the utility company failed to credit a payment. Lots of possibilities here, no shame, just a situation to deal with. Do you have gas to any other devices in your home? If other things are working, then it is just the water heater, see above. If everything is off, you will need to contact the gas utility and determine the problem. If they shut it off for any reason, once the matter is resolved, you will need to wait until they come out and restore the service before you can light the pilot light. If this has happened you will definately need go through the lighting instructions. See the article on 'lighting a pilot light' for instructions on what to do. If you have followed the lighting instructions correctly, the gas valve should allow the pilot light to continue to have gas. When it will not stay lit it is a sign of a defective 'thermocouple'. The thermocouple senses heat from the pilot light and sends a signal back to the gas valve. When they fail the gas valve will not open. See the discussion on 'gas water heater thermocouples' for more information. There is a procedure that needs to be followed when you light the pilot light. See the article on 'locating the pilot light lighting instructions' for more information. The other possibility is a defective 'thermocouple' or 'gas valve'. Follow these links to determine if this is your problem.